It's no secret that one of the best ways to attract the attention of customers and appeal to their hunger, is to interest their eyes. Merchandisers can do exactly that, by allowing you to safely, practically, and conveniently display whatever foods, beverages and others items you may be selling. Make your selection from our extensive range of various sized and shaped merchandiser products, such as refrigerated bakery merchandisers, self-service merchandisers, combination preparation and refrigerated units, deli and display cases, heated service cases, countertop freezer display cases, vertical glass display cases, floral merchandisers, and much, much more. 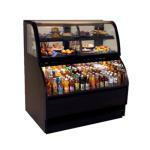 Browse our collection of dual temp deli style merchandisers. 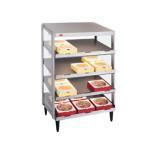 These merchandisers offer split non refrigerated and refrigerated interiors. Self contained units. Browse our huge selection of upright and vertical freezer merchandisers. These freezers are ideal for any food service area for frozen food and drink items. 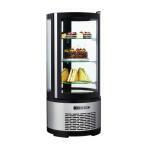 Browse a huge collection of self serve style refrigerated merchandisers. These merchandisers are offered in vertical, end cap and horizontal reach in designs. 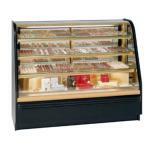 Here you can browse our collection of red meat deli style display cases. 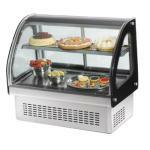 These deli merchandisers are self contained with refrigeration and condensation control. Here you will find our pick of seafood and poultry merchandisers. These merchandisers offer dual ice trays, glass fronts, designed for remote refrigeration. Browse our collection of chocolate and confectionary merchandisers. These non-refrigerated climate controlled cabinets keep chocolates at the proper temperature. ere you will find our collection of sushi display cases. 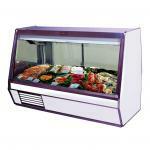 These specialty horizontal cases are offered in self contained and remote refrigeration set up. Browse our great collection of curved glass merchandisers. Offered in mobile and stationary designs. Curved glass front, adjustable tiers, sliding rear access. 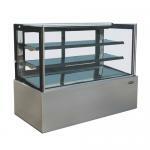 Browse our collection of vertical display cases and merchandisers. Many of these display cases offer rotating shelf displays. Stationary and mobile designs. 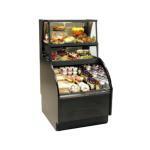 Browse our collection of vertical refrigerated merchandisers. These reach in refrigerator merchandisers are illuminated with a wide range of configurations. 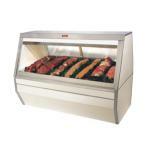 Here you can browse our huge collection of open air curtain refrigerated merchandisers. 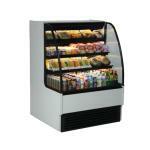 These illuminated merchandisers are designed for remote refrigeration. 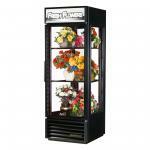 Browse our collection of vertical floral display merchandisers. These illuminated vertical displays are offered with single to multiple display compartments. Here you will find a great collection of countertop freezer displays. These freezer displays are perfect for ice cream, frozen drinks, frozen foods and more!